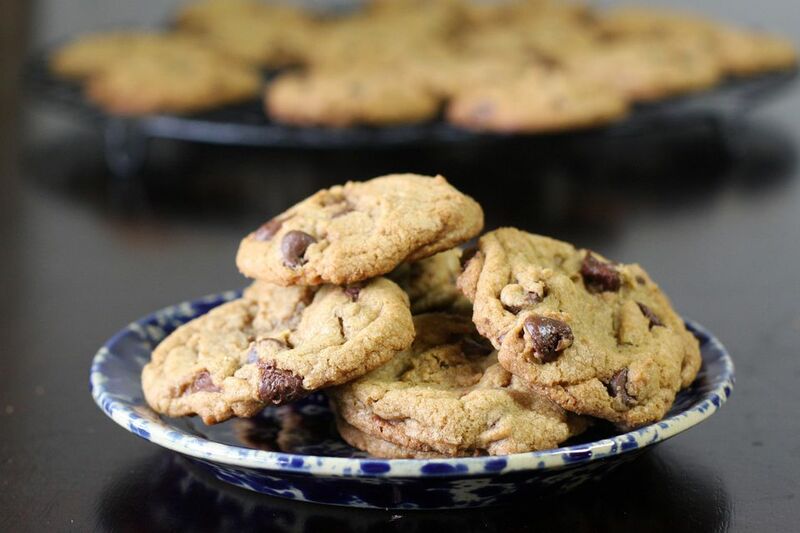 These chocolate chips cookies get nutty, buttery flavor from browned butter. Browning the butter takes only a few minutes, and it will take your chocolate chip cookies to a whole new level, especially with the additional vanilla. Brown the butter: put the butter in a saucepan and place the saucepan over medium heat. Cook until the butter begins to simmer. Continue cooking, stirring, just until butter begins to turn golden brown, about 4 to 5 minutes. Pour the melted butter off into a measuring cup or bowl, leaving the darkest sediment behind. Let the butter cool to room temperature. In a large mixing bowl with an electric mixer, beat the browned butter and the granulated and brown sugars until light and fluffy. Add egg and egg yolk, milk, and vanilla. Beat on low speed until well blended. In a separate bowl, combine the flour, baking soda, and salt; whisk or stir to blend thoroughly. Gradually add the dry ingredients to the egg and butter mixture, mixing on low speed until soft dough forms. Scrape the bowl a few times. Fold in the chocolate chips. Cover the bowl and refrigerate for about an hour or overnight, or until the dough is chilled. Line a baking sheet with parchment paper or a silicone mat or spray the pan with nonstick cooking spray. Using a cookie scoop or tablespoon, drop mounds of dough onto the prepared baking sheets, allowing about 2 to 3 inches in between the cookies. Bake for 6 to 10 minutes, or until the cookies are browned around the edges. Cool completely and transfer to an airtight container for storage.